Judging by these first three renderings, this latest wallycento will be the ultimate and most current dual-purpose superyacht afloat when she launches in 2017. wallycento #4 combines Mark Mills’ eye for a super-slippery race hull, with the ultra-minimalist style Wally is famed for. 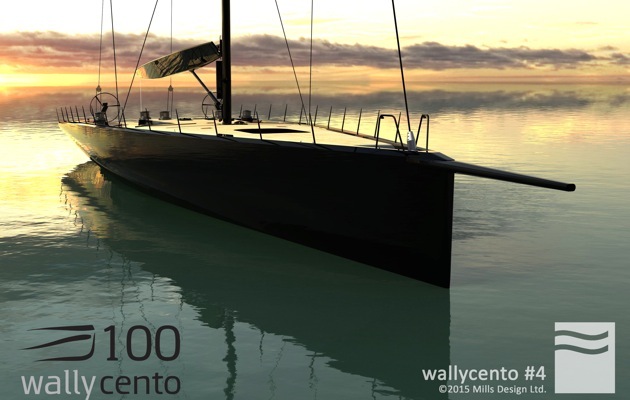 Wally says that this fourth wallycento, now under construction at the Persico Marine yard in Italy, is for a passionate racing yachtsman. She will join the growing fleet of centos, which now includes Magic Carpet Cubed, Open Season and Galateia, the latest cento that launched from Green Marine in October. The wallycento class is designed to be the ultimate racer-cruiser. The 100ft carbon fibre racing yachts have powerful, planning hulls, and weigh just 50T despite incorporating fully fitted-out cruising accommodation for six guests plus crew. “Cruising in comfort at the speed of the fastest maxi racer and racing at the highest level of competition is the dream of every passionate yachtsman,” says Wally President and founder Luca Bassani. This fourth wallycento is designed by Mark Mills of Mills Design, based in Co. Wicklow, Ireland. The black topsides contrasting with such a scrupulously clean deck looks formidable, and we particularly like the ‘afterburner’ treatment given to the bulwark ends aft! “We suggested Mark to the client because I was impressed by the performance of the Maxi72 Alegre,” Bassani explained. “Since the first meetings, we shared with him the same vision of the innovations that can be applied to this type of yachts like the cutting-edge deck layout that combines our flush-deck with bulwark introduced in 2006 with Esense, with the ramp deck of Alegre, perfectly reflecting the Wally DNA of improved functionality”. “Asked by the client to produce the most refined high performance solution to the box-ruled wallycento racer-cruiser, we assembled a team of specialists with the most open minds to review the options and create something special,” said Mark Mills. “The hull shape exhibits a combination of low drag in lighter conditions and increased stability in more wind that makes her more versatile than previous generations,” Mills explains. 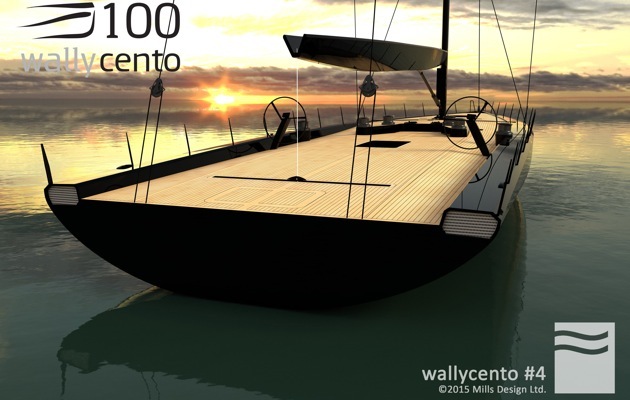 The wallycento #4 is currently under construction at Persico Marine yard, Italy, with the delivery scheduled for June 2017, in time for the second part of the Wally Class racing season.